Hurtta Outdoors Ultimate Warmer is an excellent way to provide efficient thermal insulation, especially in prolonged cold outdoor periods. 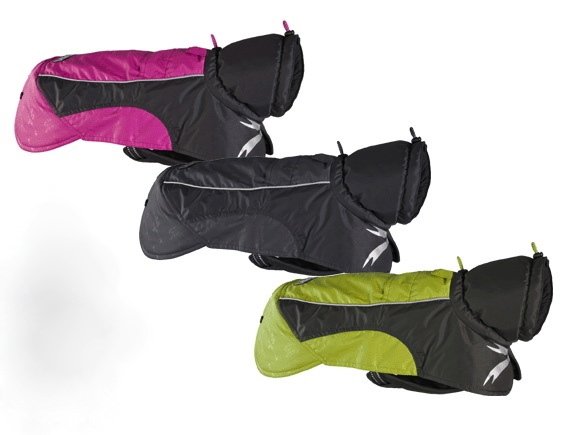 It is laminated with a breathable, waterproof Houndtex membrane and protects the dog's most important muscle groups, their neck and chest with its high collar and protective front and rear long hem. It has an adjustable collar, waist and neckline to ensure the best fit while allowing complete freedom of movement. To make your dog more visible it also comes with 3M reflectors fitted in various positions. The Birch Warmer comes in a lime green colour, Granite in dark grey and Raspberry in purple/pink. 25cm / 10" 36cm / 14" 35-40cm / 14"-16"
30cm / 12" 42cm / 17" 45-55cm / 18"-22"
35cm / 14" 50cm / 20" 50-60cm / 20"-24"
40cm / 16" 52cm / 20" 55-70cm / 22"-28"
45cm / 18" 58cm / 23" 70-80cm / 28"-32"
50cm / 20" 62cm / 24" 70-80cm / 28-32"
55cm / 22" 68cm / 27" 70-80cm / 28"-32"
60cm / 24" 72cm / 28" 75-85cm / 30"-33"
65cm / 26" 74cm / 29" 80-95cm / 32"-37"
70cm / 28" 70cm / 27" 80-100cm / 32"-39"
80cm / 32" 80cm / 32" 85-110cm / 33"-43"
90cm / 35" 88cm / 34" 90-115cm / 35-45"
There are currently no questions for Hurtta Outdoors Ultimate Warmer for Dogs - be the first to ask one!